My name is Ashley. My wedding colors are royal blue/silver with baby blue/white. How do I incorporate all these colors into my reception as far as the centerpieces, wedding favors, table cloths, chair covers, and sashes without overwhelming one color? I don’t know what color each item should be in. I am doing long tables and my main color is royal blue. Please help!! The best advice after years of designing and running events is to let one color, like your Royal Blue, take center stage. You have to let one of the colors be the star while incorporating the other colors into your design as highlight colors or else your design will look too chaotic. So if you have deep jeweled tone royal blue table cloths as your main linen on the table, have a silver thick sash down the middle of the table as an accent piece - which looks great on the long family style table. You could have all the tables look like this or you could mix it up a bit and also include silver cloths with a royal blue sash down the middle. 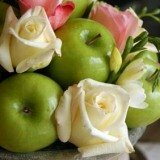 If you are using floral centerpieces, allow a floral designer to incorporate the softer pastel colors of white and baby blue flowers to the desired color scheme. You can even add a bit of silver sparkle to the florals to catch the light in the evening setting, but be cautious not to add too much or it will look cheesy. As for the chair covers, I am not a fan of the cover and would rather bring in a Chivari wood chair to really dress up the place. But if this is not in the budget and you truly do not like the chairs provided, keep them as simple as possible so as not to take away from your event table. Your tables are where everyone's eyes should truly be focused, and always remember the chair after one's derrière is in it will not been seen. Have a little fun with the whole design element and enjoy your BIG day! Wow! This your site is very interesting. I am sure that the wedding must be a is a perfect day. And your advices are very helpful for me. Please keep it good posting. And do not hesitate to use www.custom-paper-writing.org and be sure in brilliant quality all of your new posts! Wedding is very important event in everyone's life and it requires much preparation. Talking about the case discussed, I don't think that everything should be only in one color. I like the combination of colors, it looks so impressive and unique. By the way, if you want to write top-class articles or essay about your wedding you will fing high-quality help at Academic-Writings.com. I have to point out that you've propagated wonderful things using everyone. I’m getting married in October this year I know it’s far away but I want to hire a wedding planner who can plan my wedding according to my budget I was just curious because I don’t get too many off days from my office help with assignment so I can arrange all things before October like ceremony site, decor, etc. Blue is the best color for wedding theme. I think Blue with orange will be make a beautiful color combination. Nowadays blue is an important part of wedding. Your Wedding Theme is really awesome! This theme is very uncommon. It will look gorgious if it will set as the instruction of Danielle & Stephen. Yesterday I tried to ask for help cheap writing service and, don't be surprised, it's a reliable assistant in exploring fresh ideas for essay writing process. This blue wedding theme is such an appreciable idea which can bring the most beautiful experience in wedding. I would also prefer the red theme. 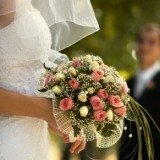 I am glad i have shared my experience with essay writing services about the wedding ideas. All your ideas are just incredible and contemporary. 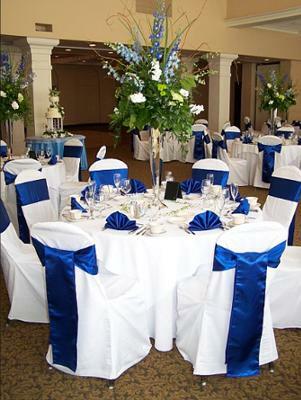 The wedding colours I like the most is chairs as same as you white and blue combination. But the table might be of white and red. And some red beads on the napkinscheese cutting board. That will be awesome. Do you like mine? help these poor children as much you can. they have nothing in their life to enjoy.help help them. they need us. a simple share can help them. Which Blue is the best for Wedding Theme form Brides to the Deco at the reception and flowers? She does want purple - al forms of purple she thinks it is too overrated (overused). Sh wanted red but recently her sister in law to be used it so she cant use it.I( the Fiance's sister used and he doesn't want her to use. Yellow her cousin used it recently Please HELP!!! Hi, I'm getting married in March 2011, and my main color is royal blue accessorized with silver and a slight touch of yellow-orange to compliment the rich blue. Can you give me some ideas on how to decorate my reception area and how I should use my accessory colors to decorate as well?